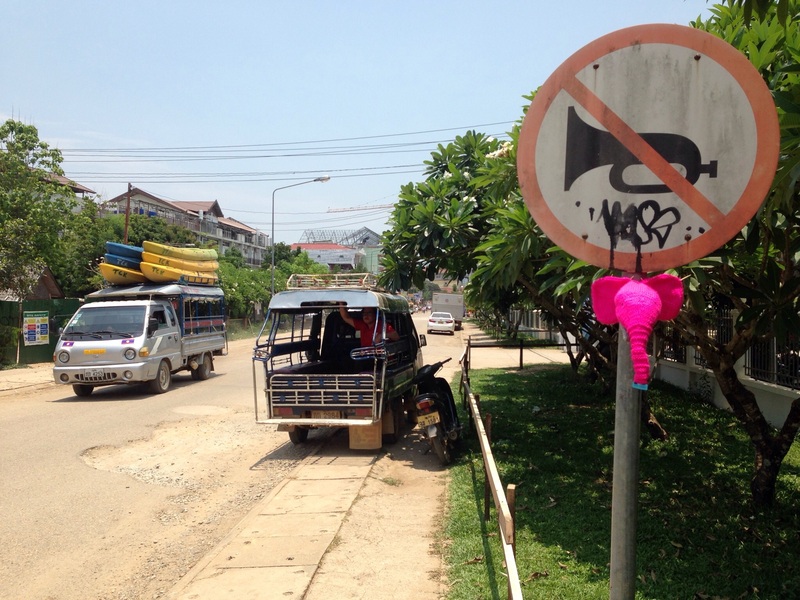 Laos is known as the Land of a Million Elephants, and while elephants aren’t parading through the streets, this is the only reason I can imagine the need for street signs that prohibit ‘trumpeting’. 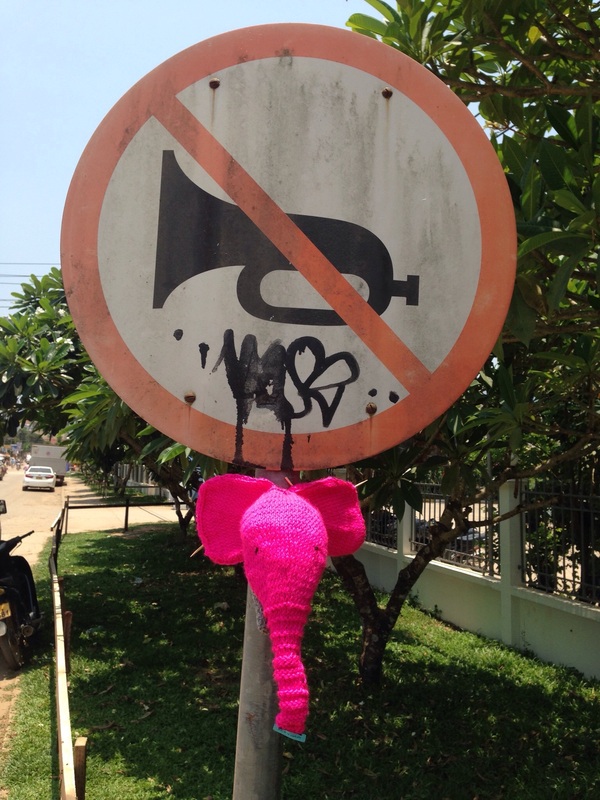 With so many elephants, obviously humans can’t be trumpeting too! L’Elephant was installed in Vang Vieng, Laos on May 14, 2016 across from my favourite pancake-street-stall and the Elephant Crossing hotel. It is once again, stuffed with plastic bags and reinforced with recycled bamboo skewers. It is the poorest country is South East Asia and is a communist country. Considered the most bombed country in the world, land mines or unexploded ordinance from the Vietnam war remain scattered through the countryside limiting development and endangering life. Amazingly, despite these facts, Laos is an attractive destination with stunning scenery, gentle people and a growing trend towards eco-tourism and sustainable development. The Gibbon Experience and Big Brother Mouse are both examples of this sort of creative, long term thinking that Laos is becoming known for. 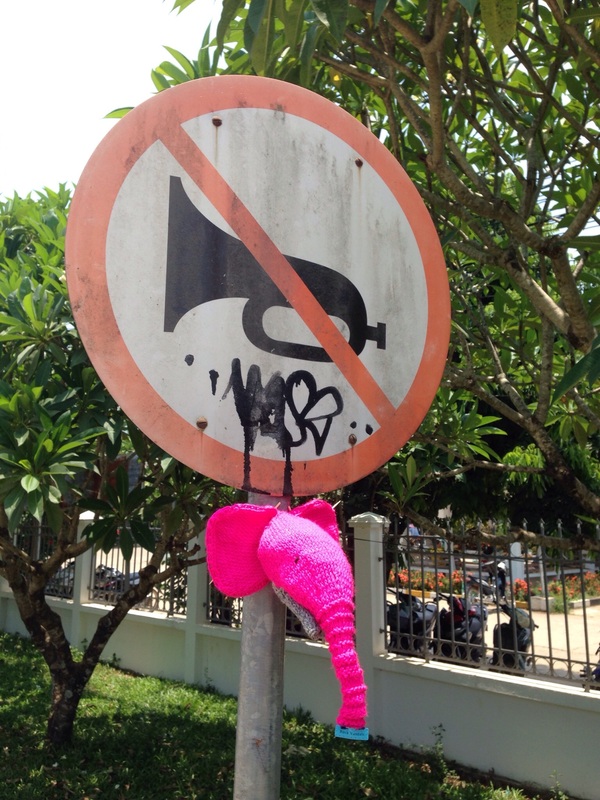 If you do find yourself in Laos, specifically Vang Vieng be sure to get on your ‘horn’ and send us a ‘truncated’ message. We will be delighted to have ‘herd’ from you! What a fabulous trip! Love your pink elephant. Pink elephants??? Why not!!! Awesome. The Rock Vandals are going through a ‘pink-phase’ Bonnie! Next up will be the era of blue! Lovely to hear from you!